As a novel is always, in some form, the product of a reader’s collaboration with an act of narration, no consideration is more telling, in the effort to convey both the fabric of its surface and also the ideology that permeates it, than to describe how the voice, the mood, the consistency, or the variety of this narration achieves its invitations to the reader. However, as Masayuki Teranishi points out, this cluster of devices is a stylistic character more often named with the helpful array of terms that classical rhetoric and modern narratology has provided than closely examined; and, in this respect, his minutely attentive and sustained study of the voice of the narration in three great novels is much to be welcomed. Although an unreformed Practical Criticism is unlikely to make a comeback after the beating it took in the era of high Theory, a capacity for close reading is still routinely praised by academics and those who read their books, and many hope that knowledge and methods drawn from linguistics and broader language study can be the means to overcome the subjective and impressionist ‘"This is so, isn’t it?" of so much literary "analysis" to get down to some real demonstration of how a passage of writing actually works. 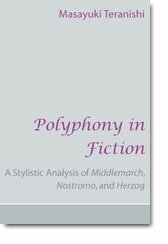 Applying stylistics as a critical tool to examine literary narrative leads Teranishi to the issue of focalization as the unifying topic of his book: it becomes his method to explore in sentence by sentence detail the ways in which Bakhtin’s various levels of polyphony might be seen to animate the narration of three paradigm novels. This mode of reference, ubiquitous in current academic writing, vitiates genuine discussion to the extent that it employs previous reading and secondary criticism as data, as information to be summoned by a mouse-click. So while Teranishi does have an original contribution to make to the field with his idea of poly-subjectivization, its innovative force as a way of opening up texts to a richer reading is rather lost in the welter of survey-work from which it struggles to emerge. On page 83 the analyses begin. Each of the three novels provides four instances of characterization (including that of the narrator), each of which is examined through four or five typical passages unvaryingly analyzed on a sentence-by-sentence basis. The focus of this analysis is (1) whether there are multiple focalizers or subjectivities in a text; (2) whether the focalizer functions as an evaluator; (3) how far the focalizer is situated from the source of the story (Implied Author), and (4) how cogent his/her perspective is. The line on Middlemarch, that it is polyphonic rather than monologic (poly: good, mono: bad, seems to be the assumption) is one that will recommend itself to devotees of Conrad, although the focus on the construction and evaluation of character does seem rather dated and less than adequate to confront what the subtle voices of the narration of all three novels have been created to explore. Here is Teranishi on the very first word of Middlemarch ("Miss Brooke had that kind of beauty..."): "The narrator seems to establish a kind of distance from the character, since ‘Miss’ is not a title likely to be employed by an intimate friend, but one conceivably employed by impersonal observers" (88). If this sort of reliance upon the common prevarications of "it seems" and "a kind of" is to be Teranishi’s method, then what need all of the preceding apparatus which is supposed to be the means of furnishing a definite demonstration? Irony asks for confident knowingness, and sufficient knowingness to undo the smugness that might accompany it: Teranisihi’s offer of tentativeness is not an illuminating substitute. In (4), while "clever" and "common-sense" refer to contrastive traits, it is unclear who is praised. Furthermore, the stylistic device employed here makes the narrator’s attitude more ambiguous. The passive phrase, "was usually spoken of," suggests that this evaluation is reputation derived from her neighbours. Middlemarchers as focalizers become conspicuous (89). But the whiff of disapproval in "remarkably" and the delightful, confidential, "with the addition that" get ignored. This book throws up the very real problem of how to conduct close analysis. Teranishi chooses short numbered passages, used in discrete sections to prove different points. A passage of twenty lines or so is substantial enough to get us involved in the novel, but that isn’t his purpose: it is to get us involved in his linguistic or narratological categorization. If, as frequently, the passage sets off two or three pages of close comment, proceeding sentence by sentence, by the time we have got to sentence (5), say, we are having to check back to the quotation and any sense of the larger movement of the passage has become fragmented by over-scrupulous and even-handed attention to small linguistic units. The problem here is that it is no longer enjoyable to read: the point is made too slowly in blow-by-blow sequential detail in the name of scientific objectivity and completeness. The great sufferer in all this, as I’ve suggested, is narrative irony, about which Teranishi’s judicious standing-off ("and even the praise of Brooke could again be read as ironic" ) is not the same as a quick subtlety of appreciation conveyed by an equally light turn of phrase. Alertness to polyphony is best conveyed not by comprehensive and exhaustive procedure – for which Teranishi is admirably equipped – but by a native wit to inhabit different sorts of utterance with certainty but with no sticky adhesion, to move as nimbly in one’s critical writing as one does in the registration in one’s ear. Teranishi does considerably better with Nostromo. He identifies four masks worn by the narrator, and for the textual analyses he also conducts of Nostromo, Monygham, and Mitchell he asks us to "consider which mask is worn for whose characterization" (165); although, as he has earlier characterized polyphony as arising where voices in the text are strong enough to compete ideologically with the narrator – for example,. Lydgate possibly, Brooke and Casaubon not – it is a lack that his chapter on Nostromo does not consider Decoud or Mrs Gould. However, his initial approach through "the general disposition of the narrator" is productive of an interesting distinction between the critical and the artistic narrative voice, and between the narrator as historian and evaluator. He usefully distinguishes for us the different "collective voices" that contribute to the narration in the first half of the novel from the narrator’s direct comments that increasingly dominate the second half. Teranishi is at his best in a section he calls ‘Transformation from "object" into "subject,’’ in which he explores how Nostromo is shown to change "from an unconsciously acting man to a consciously thinking man" (174). He identifies the paragraph which "for the first time in this novel reflects his (i.e., Nostromo’s) inner voice" (178): "... and the Capataz thought of Decoud alone there with the treasure. That man was the only one who cared whether he fell into the hands of the Monterists or not, the Capataz reflected bitterly" (Nostromo 349). Teranishi’s bold conclusion, that ‘It is in such a narrative milieu, where Nostromo’s now clear-sighted view of material interest is predominant, that the narrator linguistically merges with Nostromo’ (183), sees him moving from his micro-analysis to the larger themes of the novel in a way that one would wish more of in this study. Sadly, Teranishi’s ear for comedy deserts him when he comes to discuss ‘the excellent Senor Mitchell’. A characterization at one point of ‘Mitchell as a strong employer and Nostromo as a weak employee’, derived from Mitchell’s sense that he holds ‘the right to evaluate him’ (189), surely misses – or fails to convey, at any rate – much of the irony embedded in Mitchell’s free indirect discourse. We are offered two paragraphs of discussion upon the parenthetical " – invaluable fellow –" of Nostromo’s first appearance in Mitchell’s history, which is worthy but leaden-footed. Attention to the detail of the writing is always welcome, but the reader of Teranishi’s book can become detached from the very passages he is trying to bring us close to because of a mismatch between the suggestiveness of Conrad’s art and the exhaustiveness of the analysis. To do him justice, there are moments in which he finds a neat formulation to encapsulate his lengthy procedures succinctly: "Mitchell’s function gradually shifts from that of focalizer who evaluates Nostromo to focalized object as evaluated by the narrator" (192); and when he writes, "the micro-structure of short passages which contain ambiguous focalization makes us doubt the presence of a single truth" (195), his statement could stand as a description of his procedure and his conclusions throughout the book, whether he is discussing a pre-Modern, Modernist, or Postmodern text. Ultimately, Teranishi’s book becomes one to consult rather than to read, because he has not been able to find a balance between extensive close analysis and larger suggestions or conclusions that is pleasurable to follow. On the single sentence from Herzog, ‘Was he a clever man or an idiot?" he writes: "(7) is thus interpreted as FIT comprising the narrator’s linguistic control (past tense, third person pronoun) and Herzog’s expressive element (question, evaluation). We are encouraged to share the inner tension of Herzog who is asking a question to "another Herzog’ who is supposed objectively to evaluate his character" (240). This has local precision and force; but five pages of such analysis arising from this particular twenty-seven line passage rather crushes the unremarkable broader point when we finally get to it: "In this passage, Herzog defines himself as a fragile presence, always threatened by outer enemies" (243). It is a pity that we don’t come away from all this exhaustive analysis with some new, sharp large insights about the novels themselves, or a renewed feeling for them as novels. And Teranishi’s desire to ‘isolate potential "Pre-modernist polyphony," "Modernist polyphony," and "Postmodernist polyphony’’ (285) yields, respectively, an "unreliable pseudo-omniscient narrator," a "disbelief in the truth" and a "dialectic world-view," and an "ontological doubt about truth and scepticism about subject as origin of truth" (292), earned so methodically that the feel of these things is lost under the process of showing them to us. Teranishi has done his work: his bibliography is outstanding (although Conradians will regret that there is no Michael Greaney and nothing from The Conradian). But this is a very earnest book, and all three novels – serious though they are – ask for a mobility and a lightness to respond to their ironies. In the old New Criticism, in reading a typical small passage closely one would say something about the whole; stylistics is not so concerned to argue for a reading – and is the duller for it. So Teranishi, in electing to stay on the safe ground of textual science, inhibits his scope. There is an important book to be written on the representation of consciousness in the novel, using linguistic descriptive approaches to get beyond impressionistic assertion. Unfortunately, this book is not it, although its exercises in analysis will be useful as stepping stones towards that more creatively conceived project.